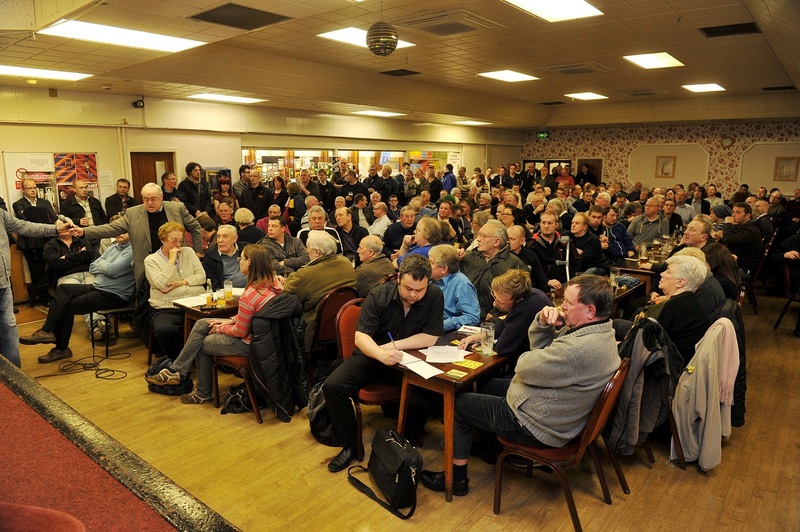 The Port Vale Supporters’ Club meeting in January 2012 at which a letter was signed by fans calling for a police investigation into the club’s affairs. 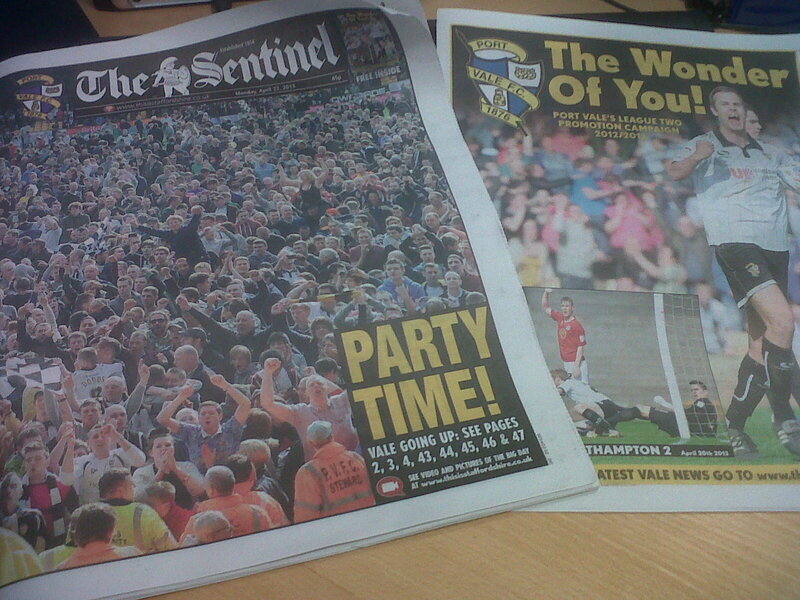 As Port Vale’s preparations for the new season continue, everything looks rosy. Owner Norman Smurthwaite continues to please the faithful with his own unique brand of public relations. The club has a popular new shirt sponsor in trade union the GMB and the impressive new club shop is the flagship for infrastructure improvements at Vale Park. Season ticket sales are going well in the light of a remarkable, against-the-odds promotion to League One, and some quality additions to the playing squad have created a genuine buzz around Burslem ahead of the big kick-off. So as an exciting new season dawns, is there any point – some will say – in dredging up the past? Because that’s exactly what yesterday’s news about the liquidation process for Valiant 2001 and the ongoing police investigation does. Many supporters have welcomed the announcement that insolvency practitioners Begbies Traynor have become liquidators for the company which formerly owned Port Vale. But others may well question the merits of digging through the ashes of the most turbulent time in the club’s history. Some may argue that it is perhaps better to let sleeping dogs lie and focus on all the positives as the club enjoys a much-needed period of stability in terms of finances and leadership. For me, however, the situation just isn’t that simple and I am pleased that Begbies Traynor will soon be attempting to recover further monies it believes are owed to creditors. As we all watched as the incredible promotion campaign came to a conclusion in May, a few of us still had half an eye on some unfinished business. We knew the police investigation instigated by the Supporters’ Club into the activities of some former directors was still trundling along. We also knew that the administrators for Valiant 2001 would very soon become liquidators and that their powers would increase dramatically as a result. Now Begbies Traynor can throw their weight behind the task of determining whether there was any wrong-doing on the part of directors who ran Port Vale prior to March of last year. I well remember, in the midst of the battle to remove the remaining members of Valiant 2001 from office, there was a very raw anger at the way in which fans – and especially shareholders – had been treated by the board of directors. There was a belief, which I shared, that supporters had been misled over the proposed Blue Sky investment, misled over the issuing of so-called ‘nil-paid’ shares and not told at all about the infamous ‘Gibraltar loan’ which involved the re-mortgaging of Vale Park from under the nose of key creditor Stoke-on-Trent City Council. I recall how Supporters’ Club members canvassed fans on the turnstiles before one home game in 2011 about the election of Perry Deakin and Peter Miller to the board of directors in the mistaken belief that they had personally invested £100,000 and £250,000 respectively into Port Vale. Of course, it was subsequently revealed that neither man had paid for the shares which they used to vote themselves on to the board and which, effectively, devalued the shares owned by more than 900 ordinary fans. These supporters dipped into their savings and used their hard-earned wages to buy shares in the belief that they were helping their club and would forever own a little piece of their beloved Vale. To have those shares – hundreds and sometimes thousands of pounds’ worth – wiped out when the club was placed into administration by the city council was a bitter pill to swallow. There is no doubt in my mind that the Supporters’ Club was right to ask Staffordshire Police to investigate the running of Port Vale by a board discredited in the eyes of many fans. I am convinced that, if financially viable, the liquidators should use all powers at their disposal to chase up monies owed to Valiant 2001 – thereby recouping as much cash as possible for out-of-pocket city council taxpayers. In my opinion this genuinely is a case of justice being seen to be done in the eyes of those who lost out and were treated so shabbily by some former Port Vale directors. It’s about making sure that every single penny that can be recovered for creditors is recovered and perhaps ensuring that fans of other football clubs don’t suffer the same losses and humiliations inflicted on Vale supporters. We can, of course, all look forward to the new season but it does us no harm whatsoever to remember how close we came to not having a Port Vale to support. Monday’s souvenir edition of The Sentinel. The euphoria surrounding Port Vale’s promotion (I’m going to call it that, irrespective of the mathematics) won’t die down for sometime yet. Certainly not until after this weekend’s final game away at Wycombe where the party will doubtless continue. The scenes at Vale Park and around Burslem after the final whistle on Saturday will live long in the memory. What was especially nice is that the players, the manager and even owner Norman Smurthwaite were able to celebrate with the fans in the pubs and at a curry house in the Mother Town. Port Vale is nothing if not a family club and to see the images of key players in the promotion sharing their success with those who make the turnstiles click was special. It was a great bonding exercise and terrific marketing for the club as the serious business of planning for life in League One begins. Vale’s attendance on Saturday was 12,500 (admittedly, it looked like more) – but in truth many of those were there specifically to share in what promised to be an historic occasion. If we’re being brutally honest, the club’s hard-core support in League Two during the dark days of the last 18 months has been around 4,500. We had the best away support in the division but while that makes such a difference to the players it doesn’t put any money into Vale’s coffers. Saturday showed the new owners, the club’s employees, lapsed fans and would-be recruits the potential of a club with a ground that is ready-made for Championship football. 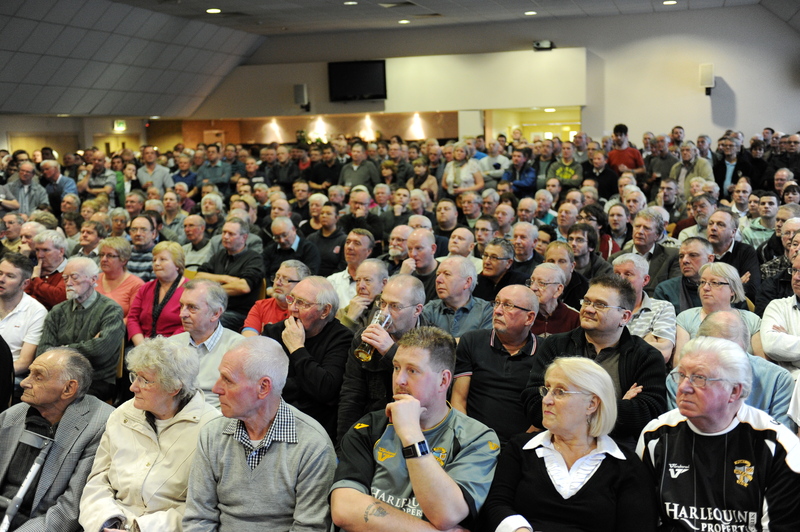 The trick now is to convert those who enjoyed an emotional afternoon on Saturday – all the wives, brothers, children, fathers, mothers, grandparents, friends and workmates – to become regulars at Vale Park. In reality the work of the new owners is just beginning because Micky Adams’s players have done wonders this season and, as a result, expectation levels have now risen considerably. Anyone who’s been watching Vale regularly knows that we are half a dozen key players short of a team which can compete with the best teams in League One. I don’t think anyone should be using the word consolidation. Aspiration is the word we should instead be using. We should be aiming for the play-offs by strengthening the squad through smart signings over the summer. Then, once we’ve got the 50-odd points on the board which will make us safe, we can see where the season takes us. Off the field Norman Smurthwaite and Paul Wildes know they are at the start of a long road. They know that we still tend to run out of refreshments on match days. They know that the seats in certain sections of the ground are a decade past their use-by date – sun-bleached and frost-wrecked so as to be brittle enough to shatter if a ball hits them. They know Tommy Cheadle’s is too small and not really fit for purpose. They know the Lorne Street needs finishing. They know the pitch needs re-laying – irrespective of the magic groundsman Steve Speed and his team work. They know there’s a terrific opportunity to finish the oft-talked about Robbie Williams suite. They know that Port Vale needs to build bridges with local communities and start getting into local schools to nurture the next generation of fans. They also know that the honeymoon period hasn’t really ended for them. Barring a blip about six weeks ago when the team wasn’t performing, Messrs Wildes and Smurthwaite haven’t seen supporter unrest and haven’t had to deal with anger and frustration at games, in the media or on the internet. The acid test for them will come if we lose six games on the trot and are sitting in the bottom three half way through next season. That’s when you have to hold your nerve as the owner of a club and not get swept along by disappointment or have a knee-jerk reaction. This sport is the graveyard of many a fair-weather owner and it is good to know that Norman and Paul who, (by their own admission) are not football people, are ‘in it for the long-haul’. They have been as good as their word so far, backed the manager in the transfer market, and done their best to listen to fans’ concerns. In return, I hope supporters will give them time and all the backing they need when the going gets tough. After everything that’s gone on in recent years – the protests, the boardroom shenanigans, the broken promises, the fantasy deals, the administration, the bucket collections, the vanishing bidder and finally a takeover – this season’s achievement must rank up there with one of English football’s greatest comebacks. Of course, we shouldn’t forget that very soon the administrators who successfully sold the club will soon become liquidators for the old Valiant 2001 business. This will give them far greater powers and certain people who owed Valiant 2001 (and its creditors) money can hopefully expect a call soon. Let’s also not forget that, thanks to the Supporters’ Club, Staffordshire Police are currently investigating allegations of wrong-doing by some former directors of the club. These activities don’t affect the Port Vale which has just been promoted to League One but I’m sure they are still important to the many fans and shareholders who lost out when the club went bump. For now, however, Port Vale fans can enjoy the moment and reflect on just how far their club has come. From the blink of oblivion to promotion and celebration. When Norman Smurthwaite sent a text on Monday to say all was good and that the takeover of Port Vale would be completed the following day I felt an enormous sense of relief. Yesterday marked the end of a very long and, at times, incredibly dark road for Port Vale, its staff and its long-suffering supporters. For me, personally, the takeover means I can now step down from the Supporters’ Club (SC) committee knowing that we have achieved what we set out to achieve. The self-interested few who were running Port Vale into the ground 12 months ago are history and will very soon be hearing from the liquidators of the old Valiant 2001. Crucially, Port Vale is out of administration and under new ownership. I’m proud to say that during the last 12 months the SC has grown in membership from 200 to more than 1,600. 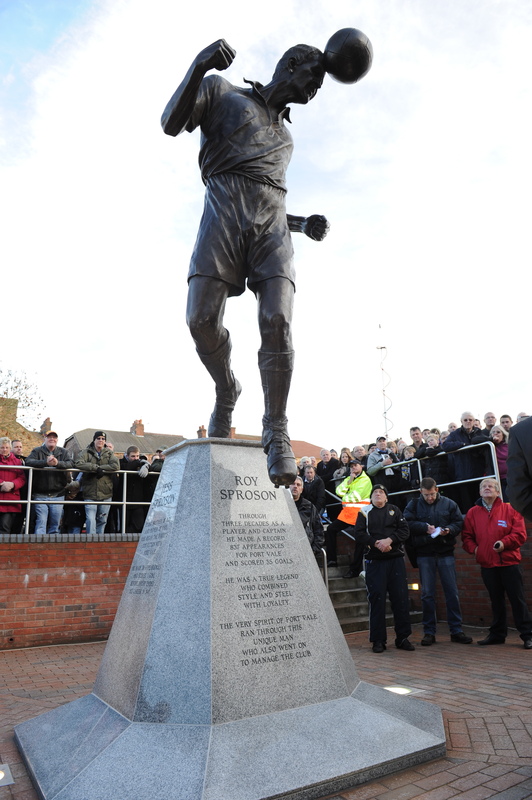 And, after 11 years, the Sproson Statue is finally in-situ and looks magnificent. It is about 18 months ago that I stumbled from the EGM, shell-shocked that the will of the vast majority of ordinary shareholders in Port Vale had been denied. Hopefully, I’ve kept a promise to a supporter called Caroline who was standing outside on that day. Fast forward a few months – December 1, 2011, to be precise. That’s when the SC committee members had their first spectacular falling out with Perry Deakin and Peter Miller. What began as a cordial discussion descended into a slanging match when Messrs Miller and Deakin were presented with evidence of the issuing of half a million pounds worth nil paid shares. Then they locked us out of Tommy Cheadle’s. The gloves were off. What followed was several months of digging, arranging meetings, seeking legal advice and protests. We exposed the fact the Blue Sky deal was dead and unearthed the sorry saga of the re-mortgaging of the club and the Gibraltar loan. We even went as far as to create an interim board in preparation for a second EGM which never happened. Of course, the SC was able to draw on a reservoir of goodwill formed by years of unhappiness and unrest. It was able to bring together groups like North London Valiants, Black and Gold and the Starve ’Em Out campaign under one umbrella. Let’s never forget it was these people who started the fight. They laid the foundations for change. Ultimately, together, these groups and the SC were to prove an irresistible force – one which put paid to the likes of Miller and Deakin, Mike Lloyd and Glenn Oliver. When the club went into administration earlier this year there was absolutely no guarantee that Port Vale would survive. But thanks to the city council we were given a lifeline that we clung to for grim death. Fans collected money in buckets, bought mugs and t-shirts and showed the local authority that they were right to help save our unique local heritage brand. Then the Keith Ryder affair almost derailed everyone’s good work. However, yesterday we crossed the finish line. Together. I can’t give any guarantees about the future. Football is football. Owners and fans alike are fickle. Circumstances change. Players and managers come and go. But I think Port Vale is now in a better position than it has been for many years and its success or otherwise is now down to the business people who run it – not the SC, not shareholders, not the administrators nor the cretins who used to be in charge. Port Vale will be run by some blokes who know full well the importance of making it a customer-focused business. Who knows, we may even have a shot at promotion this season with the Sneyd Green Pontiff leading the line. At least now we can focus on what’s happening on the pitch rather than off it. During the last 12 months I have fallen out with everyone: My colleagues at The Sentinel; my friends on the Supporters’ Club committee; various bidders; the administrators and even club staff. My friends and I on the SC committee have been called all the names under the sun by keyboard warriors who haven’t been prepared to say it to our faces or lift a finger to help. They include supporters of failed bidders for the club, former club staff, former directors and even disgruntled ex-SC committee members. Some people still maintain we were wrong to campaign for change. Some people will never admit when they’re wrong. I’ve witnessed unbelievable self-interest from people who really ought to have known better. I’ve been abused while collecting money in a bucket at the Bycars turnstiles and on The Sentinel’s website by some wag who now refers to me as ‘the mob’s favourite journalist’. How my gaffer must love that. Not. Frankly, being involved with Port Vale Supporters’ Club has been a thankless task. We’ve often doubted ourselves. There have been countless hours spent on the telephone and in meetings. Many a sleepless night because of what we’ve learned. We’ve been party to discussions which have left us genuinely gobsmacked and been given information which has been dynamite. Much of it still is. But we’ve only ever acted in what we consider to be the best interests of the club. That is the truth. Just ask the administrators or Norman Smurthwaite if you don’t believe me. Just ask Phil Sproson and the wider Sproson family. There’s a book in this and one day soon, perhaps, I will sit down with Gary Benson and write it. Again, it depends what’s in the best interests of Port Vale and, sometimes – as we have learned, it’s better not to rock the boat. It has been a privilege working with Gary and Pete Williams, my other colleagues on the SC committee and our solicitor Stephen Inglis. It has also been a genuine pleasure to meet so many decent, honest and passionate Port Vale fans – many of whom I’m now proud to call friends. Whatever the future holds I’m confident that Vale will be alright precisely because of people like Gary and Pete and the hundreds more who have fought this fight with us. Today we can all be proud. Now we really can look forward and not backwards. I’ve been as positive as anyone about Vale and urging people to pull together for the good of the club and set aside any differences they may have. But I can’t escape the fact that there’s still a lot of discussion over the current state of affairs off-the-field at Vale Park. Keith Ryder’s disappearing act has thrown a spanner in the works and left the club in limbo (administration) and whilst it is great to be watching football again at Vale Park we can’t ignore the fact that the future remains uncertain. Many are pointing their fingers at the administrators for failing to do their homework. Others blame the Supporters’ Club for being ‘taken in’ by Keith Ryder. For what it’s worth, I think everyone who campaigned for change was right – irrespective of whether or not Keith Ryder let down the administrators. I certainly wouldn’t change a thing about the way the Supporters’ Club conducted itself. We’e always done what’s best for the club – something which can’t be said for many people involved in this pantomime. I think it’s very easy to throw stones from sidelines. Tell me whether or not you think the fans/Supporters’ Club/and yes, yours truly, were right to campaign for the removal of Valiant 2001 and the old board. Or tell me why you think we were better off under Bill Bratt, Glenn Oliver and Mike Lloyd and co. Comments on the actions of the administrators and the Supporters’ Club are very welcome! There have been plenty of false dawns at Vale Park in recent years… Valiant 2001. Harlequin. Ameriturf. Blue Sky. So many, in fact, that it’s actually incredibly hard for supporters to put their faith in anyone or anything. But maybe, just maybe, in a few years’ time people will look back on this week’s open fans’ forum with Keith Ryder as a watershed moment and say: ‘I was there’. Yes, the club is still in administration and there are certainly no chickens being counted in Burslem just yet. But the impressive turnout by fans to welcome the preferred bidder to the club on a cold, wet, Wednesday night spoke volumes for Port Vale’s potential. As did the atmosphere in the meeting which was heavy with optimism. There was a sense that, after years in the wilderness, perhaps there was a brighter future ahead for the other football club in the Potteries. One of the most pleasing aspects of the meeting was the way the main man conducted himself. Clearly nervous at first, obviously not relishing his moment in the limelight, he palpably grew in stature and confidence as the evening wore on but never lost that initial humility. When he spoke he was respectful to his customers, didn’t promise the earth and acknowledged that there was a great deal of work to be done to resuscitate Port Vale. He seemed to me to give an honest, measured assessment of where the club is at present and he gave glimpses of where Vale could be if managed properly. What’s more, Keith Ryder clearly understands the damage caused by previous regimes and the need for an ongoing dialogue with the supporters who have rescued it from oblivion. All in all, to quote one member of the audience, he was ‘a breath of fresh air’ after years of posturing, prevarication and self-interest by smug suits who put themselves before the Vale. It is, of course, still early days and – as we have seen many times before – talk is cheap. But no-one who attended Wednesday night’s meeting could, in all fairness, pick fault with what they heard. If Keith Ryder continues in this vein, if he is as good as his word, then he will be able to tap into a huge reservoir of goodwill and I’m convinced the lapsed fans will flood back to Vale Park. 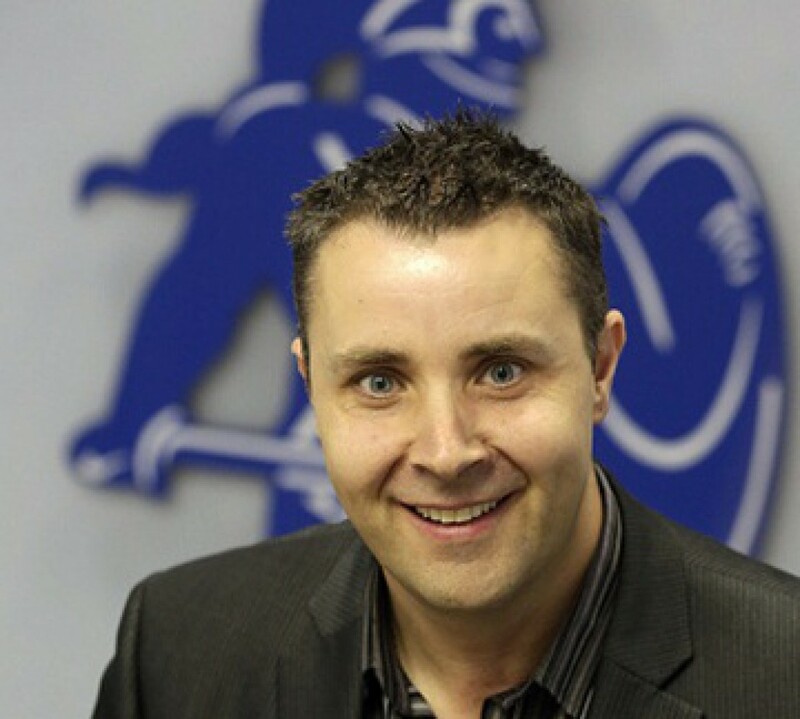 What is certain is that, united, Vale fans are stronger and – who knows – in this unassuming Lancashire businessman we may at last have found a leader worth following.